Choose a size Regular 26 in. Regular 28 in. Regular 30 in. Regular 32 in. Regular 33 in. 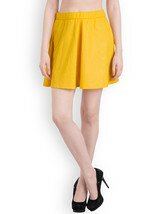 Glam up your season by wearing these vibrant colored skirt from Rider Republic. Update your wardrobe with comfortable yet fashionable skirts.